Meet Tsion, an eleven year old Ethiopian girl as she talks about her life and her country. Stunning photographs bring the reader to Tsion s house, school, church, dinner table and more. Informative cultural facts are included. Amharic words for each page are transliterated for easy pronunciation. Book Awards received: Noteable Books for a Global Society, Moonbean Children's Book Awards, Benjamin Franklin Award, Independenct Publishers Book Award, Skipping Stones Honor Award. Advance Praise: The striking photographs and carefully selected domestic scenes in Tsion s Life beautifully capture the day-to-day of one Addis Ababa family. This charming book is perfect for parents and educators seeking to give children an engaging and accurate glimpse into life in Ethiopia. 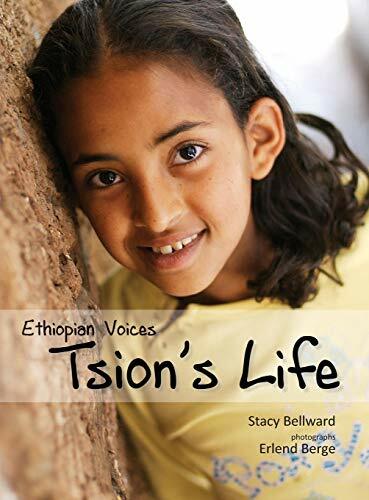 No Ethiopian Voices: Tsion's Life Read a customer review or write one . Stacy spent her teenage years in Tanzania, and although she has lived and worked on four continents, she holds Ethiopia especially close since adopting their Ethiopian-born daughter. In response to the lack of Ethiopian resources for adoptive families, she wrote her first book, "Our First Amharic Words". Together with her husband, Paul, she launched Amharic Kids. Stacy and Paul live with their two daughters in Minnesota.